Alex Pines, Faculty Senior Scientist in Berkeley Lab’s Materials Sciences Division and the Glenn T. Seaborg Professor of Chemistry at UC Berkeley, is one of the world’s foremost authorities on NMR/MRI technology. He’s also a celebrated teacher, famous for his graduate and postgraduate Pinenuts, many of whom have gone on to fill leading positions at other institutes around the world. As one of the 19th century’s foremost essayists and orators, Ralph Waldo Emerson knew more than a little something about communication. Emerson long held that in the ideal communication, one’s own nature is revealed. From a scientific standpoint, the atom has few rivals when it comes to meeting Emerson’s ideal. Atoms and the molecules that they form are more than ready and able to communicate their nature to those who have mastered any one of several different languages they use. Of these languages, perhaps none is potentially more revealing than “nuclear magnetic resonance” or NMR, and its sibling, “magnetic resonance imaging” or MRI. And of those who have mastered the language of NMR/MRI, there is none who has mastered it better than Berkeley Lab chemist Alexander Pines. To call “Alex” Pines one of the world’s leading authorities on NMR/MRI technology is an understatement. 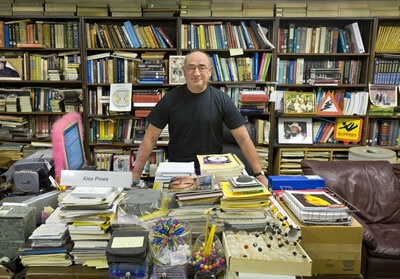 Pines, who holds joint appointments with Berkeley Lab’s Materials Sciences Division and with UC Berkeley, where he is the Glenn T. Seaborg Professor of Chemistry, has worked with an ever-changing but consistently creative and dedicated group of graduate students and post-doctoral researchers (affectionately referred to as “Pinenuts”), plus a long-standing core of collaborators, to essentially re-define what NMR/MRI technology is. Like the ultimate therapist, he has extracted from atomic nuclei an on-going series of increasingly sensitive self-revelations under ever-broadening situational settings. Over the past two decades, Pines has been using NMR/MRI technology to carry out a veritable communications gabfest with atomic nuclei. This issue of SABL debuts the first in a series of three articles on the latest of the lengthy but still growing list of accomplishments by Alex Pines and his Pinenuts. Atomic nuclei which harbor at least one unpaired proton or neutron, such as hydrogen, will spin about an axis like miniature tops. A spinning nucleus acts as if it has a north and south pole and will attempt to align itself with an external magnetic field. NMR/MRI technology is built upon the fact that atomic nuclei which harbor at least one unpaired proton or neutron will spin about an axis like miniature tops. The prime example is hydrogen, whose nucleus consists of a single proton. This spin gives rise to a magnetic moment, which means the nuclei act as if they were bar magnets with north and south poles. In the presence of an external magnetic field, these spinning “bar magnets” attempt to align their axes along the lines of magnetic force. However, the alignment is not exact, which results in a wobbly rotation about the force lines that’s unique for each type of nuclei. Should these nuclei also be bombarded by radio waves while exposed to the magnetic field, they will absorb and re-emit energy at a specific frequency according to their rotation. This frequency resonance becomes a signature signal that can be used to identify the nuclei by type. 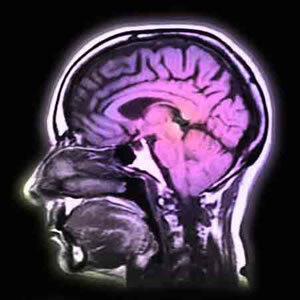 Conventional MRI used for medical purposes generates recognizeable images based on the hydrogen content (primarily water) of tissue. When spinning nuclei absorb the energy of an incoming radio wave they get knocked out of alignment with the external magnetic field lines. As they lose this energy the nuclei come back into alignment. The rate at which resonating nuclei realign themselves with magnetic field lines yields detailed information on their position and motion with regards to neighboring nuclei. In NMR, the frequency of the incoming radio wave is varied, and all of the different frequencies absorbed and emitted by the nuclei in a sample material are measured to obtain a resonance spectrum. In MRI, the frequency of the incoming radio wave is kept constant, but the strength of the external magnetic field is varied. The resulting resonance signal can be translated by computer into a recognizable image. Through NMR/MRI scientists can study the structural, dynamic, and spatial relationships of atoms in a sample of molecules. No other technology provide so much information without doing something that changes the nature of the sample. Atomic nuclei may be loose-lipped, but they are the ultimate in soft talkers. As a result, NMR/MRI technology suffers from an inherent and serious minus – a notoriously weak signal. The problem stems from the fact that when spinning atomic nuclei align themselves with the lines of a magnetic field, their axes point in either an “up” or “down” direction. The NMR/MRI signals from nuclei pointing in opposite directions cancel one another out, just as a positive electrical charge cancels out a negative charge. If a sample were to contain an equal number of nuclei with spins pointing up and down, no NMR/MRI signal would be obtained. At room temperature, the natural population difference between up and down nuclear spins in a typical sample of molecules, even under the influence of a powerful magnetic field, is usually no more than one in 100,000. This low degree of spin polarization (meaning spin axes that point in a single direction) has been a persistent challenge for NMR/MRI, and one that Pines has persistently sought to overcome. Hyperpolarized xenon and other noble gases can be used to substantially boost the NMR/MRI signals of other atomic nuclei in a solution, causing these nuclei to light-up. Ten years ago, Pines was able to show that when hyperpolarized xenon gas is bubbled into a solution, the polarization of its nuclei is transferred to the nuclei of other molecules, resulting in an amplification of their NMR/MRI signals by at least four orders of magnitude. Until that time, NMR/MRI had not been very useful in surface studies because signals coming from the bulk of a sample material tended to drown out signals from the surface (the first few layers of molecules), which happens to be where most chemical reactions take place. Since that initial breakthrough, Pines and various collaborators have been able to widely expand the use of hyperpolarized xenon. Most recently, he and members of his group have been using hyperpolarized xenon in a remote NMR/MRI signal detection scheme (meaning signal encoding and detection are carried out independently) that makes NMR/MRI technology compatible with microfluidic “lab-on-a-chip” technology. However, hyperpolarized xenon and other noble gases are expensive, and their production requires costly polarization equipment. Also, because they are inert, noble gases do not interact with other molecules, which means they cannot be used to follow one of the most important of all surface chemistry reactions – catalysis. Virtually every single industrial manufacturing process that involves chemistry starts with a catalytic reaction between the surfaces of two materials. Yet researchers still lack a way to directly observe many of the fundamental processes underlying catalytic reactions, which hampers the development of new, more efficient and greener catalysts. NMR/MRI technology could fill this void, and once again, Pines and his Pinenuts are showing the way. In a new collaboration, Pines and members of his group are developing complementary alternatives to the more expensive hyperpolarized noble gases by polarizing the molecules in their samples with parahydrogen. At standard temperature and pressure, hydrogen gas is a mixture of two molecular forms – ortho and para – with the former making up about 75-percent of the population. Both molecular forms are diatomic, but in orthohydrogen, the spins of the two protons in the nuclei are pointed in the same direction (parallel), whereas in parahydrogen, the spins of the two protons point in opposite directions (anti-parallel). 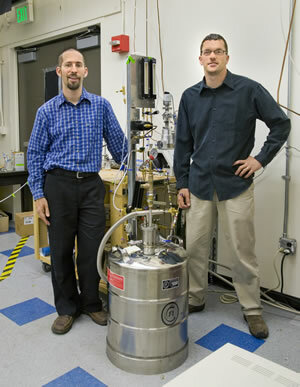 Scot Burt (left) and Louis Bouchard are members of a team led by Alex Pines that’s developing techniques for using hyperpolarized parahydrogen to obtain a strong MRI signal from samples in the gas-phase. Through the complicated surrealities of quantum statistical mechanics, in particular the Pauli principle, which dictates that a hydrogen molecule must obey certain symmetry considerations, the spin of parahydrogen nuclei are enriched in the para state even at room temperature and in the complete absence of a magnetic field. Under the right conditions, this hyperpolarization can be passed on to other nuclei and used to substantially boost the strength of their NMR/MRI signals. How substantially? Under high magnetic field conditions, by four to five orders of magnitude; under the influence of an extremely low magnetic field, i.e., Earth’s, by nine or more orders of magnitude. One problem, however, is that under ordinary conditions, parahydrogen comprises only about 25-percent of the molecular population in a given sample of hydrogen gas. To overcome this, Pines and his group transform or “interconvert” orthohydrogen molecules into parahydrogen molecules. Using liquid nitrogen to quickly cool gaseous hydrogen, then iron(III) oxide to catalyze the interconversion of ortho- and parahydrogen, they can produce hydrogen gas with enrichment levels of parahydrogen as high as 50-percent. Using liquid helium as the coolant produces levels of enrichment close to 100-percent. The parahydrogen enhanced gas can then be used to fill cylinders, providing them with a transportable supply. In this series, (a) shows a high-resolution water proton image of a cross-shaped Teflon phantom with the NRM/MRI tube shown as a circle (b) shows a gas-phase image based on conventional MRI signals and (c) shows a gas-phase MRI produced through parahydrogen induced polarization. Now, Pines and a team that included Louis Bouchard and Scott Burt plus Anwar and others, have found a way to use parahydrogen enhanced gas in combination with propylene gas and a heterogenized catalyst to achieve a strong MRI signal from samples in the gas-phase, something that has only been done before using hyperpolarized noble gases and expensive polarization equipment. Previous experiments with parahydrogen were carried out in the liquid phase only, and the polarized fluid would often be contaminated with a homogenous catalyst that needed to be recovered. In their setup, a mixture of propylene and parahydrogen enriched gas (about 40-percent parahydrogen) is flowed through a reactor cell containing a heterogenized catalyst – the Wilkinson’s catalyst (a chemical compound named for Geoffrey Wilkinson, the 1973 Nobel Laureate chemist who popularized its use) – that’s been immobilized on a modified silica gel at temperatures between 60 and 150 degrees Celsius and at 100 psi. As the parahydrogen enhanced gas mixture passes over the catalyst, hydrogenation takes place. This produces propane gas that is transferred to an NMR/MRI magnet and spin polarized through an effect known as ALTADENA (Adiabatic Longitudinal Transport and Dissociation Engenders Net Alignment). The catalyst-free hyperpolarized propane gas can then be used to enhance NMR/MRI signals. Pines and his group have so far observed NMR/MRI signal enhancements of nearly three orders of magnitude over conventional thermally-polarized signals. They project that under optimized conditions, signal enhancement could be further improved by another order or magnitude. While the potential for using parahydrogen to image chemical reactions at the molecular level during catalysis is an enticing promise, the more immediate application of the techniques being developed by Pines and his group might be medicine. MRI based on the water-proton signal is not useful in tissue that contains little or no hydrogen, and conventional MRI scans of void spaces, such as the lung, typically yield no meaningful image. However, if a gas mixture that contains a hyperpolarized spin species is used, it will cause the void space to light up with an MRI signal that should yield a detailed, sufficiently contrasted image. In the experiments conducted by Pines and his group, hydrogen gas (H2) is chilled and catalyzed to enhance the parahydrogen content (A). It is then mixed with propylene gas (B) and the mixture is sent through a catalytic cell to produce propane (C). This propane is then polarized via the ALTADENA process and used to generate an MRI of a phantom. Enhanced parahydrogen gas also makes it possible to use NMR/MRI technologies in low and ultra-low magnetic fields, and it has tremendous potential for use in microfluidic lab-on-a-chip devices. Pines, Bouchard, Burt and Anwar recently published a “VIP” paper in the journal Angewandte Chemie on the parahydrogen research entitled: “Parahydrogen-Enhanced Hyperpolarized Gas-Phase Magnetic Resonance Imaging.” Co-authoring the paper with them were collaborators Kirill Kovtunov, Igor Koptyug and Renad Sagdeev of the Institute of Catalysis and the International Tomography Center in Novosibirsk (Russia).